On Saturday I had a big nesting day. It was triggered by the arrival of a new fridge to finally replace our old+noisy "Fridgey" (affectionately named by Tom). 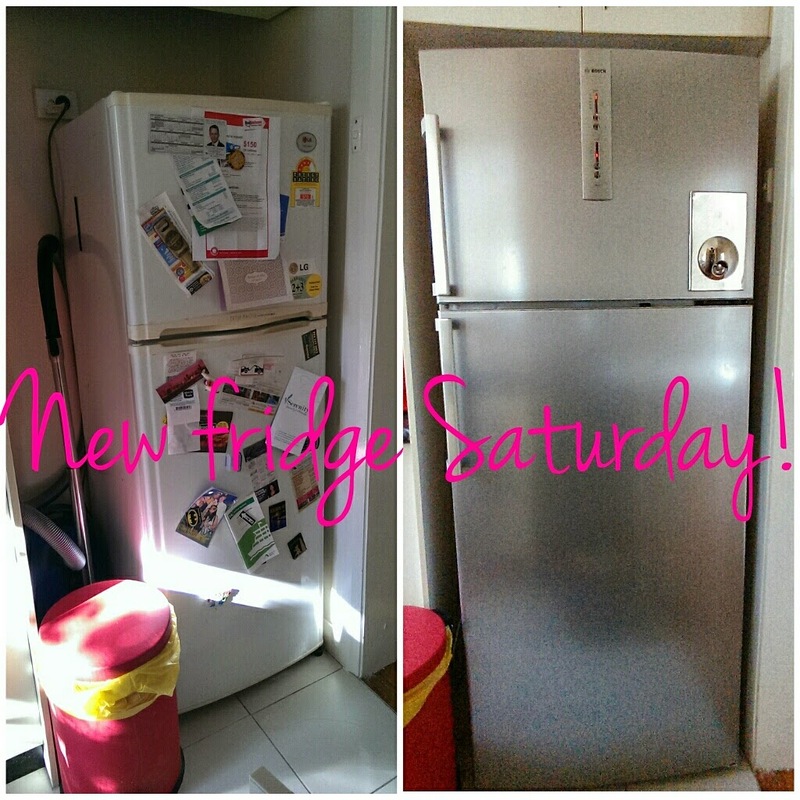 Fridgey came to us second hand (possibly third or forth hand but I tried not to think about it) as we had just moved into a sharehouse and we didn't want to buy a brand spankin new fridge since we lived with 5 guys in the house. 7 months later while we were travelling throughout the US on a 4-week holiday, we received notice from the landlord that they were returning to the country and would move back into their house. A manic few weeks of open houses ensued and we snapped up an apartment on a 3-day turnaround and moved that weekend. No time to think about a new fridge. Then 6 months ago we were travelling through South America on another 4-week trip and guess what - we got notice the owner was intending to sell. Not only did we have to allow people through to inspect the apartment weekly but we had to find a new place to live. This time we had a bit more time up our sleeves but with Christmas coming up and busy jobs we again failed to find time. Toms's always had a soft spot for Fridgey. While I found Fridgey's late night gurgles annoying, Tom found them endearing. Finally Tom's brother decided to offload his almost brand new fridge and we I jumped at it. We haven't named her yet (I fear it may be too soon for Tom) but she has been great so far. The crisper is slightly cooler than the rest of the fridge, the inbuilt wine rack has already been put to good use; there is a 'quick freeze' compartment in the freezer, an in-built ice tray. The temperature is controlled from the outside and she is whisper quiet. I spent some time 'setting up' my new fridge and realised just how little food we were able to fit in Fridgey. Half-full for Fridgey was almost bare for the new fridge (new fridge is double the size of Fridgey). I'm sure I will fill it in no time! Love the new fridge!!!! Are you going to be able to fill the front door with magnets and notices? Mine is covered in them. Love the fridge! I want a new one desperately as ours is second hand, but I know when we move the fridge will be scraped along the doors (our doors aren't very wide) so we may aswell keep the one that's already got scrapes until we buy a house. Yeah that's kinda what we were thinking ourselves but buying a house seems to be at least 18 months off so I thought I might as well do it now. Awww poor Fridgey! Yes, I think it is too soon to name the new baby (sorry). I love what you thought was annoying; Tom found endearing (haha)! The new fridge looks awesome, I love the new upgrades in the fridge and I am glad you are putting them to good use. I KNOW. We have the worst luck going on holidays and it reinforces to Tom all the reasons why he doesn't like going away.